What would Vanellope be without her arch-enemy, King Candy? I’ll tell you what…a pretty pampered petite princess! She would not have had the character-building experience of finding her place in the world, and she would probably have never met Ralph…or Felix…or even Calhoun! She should be thanking him! 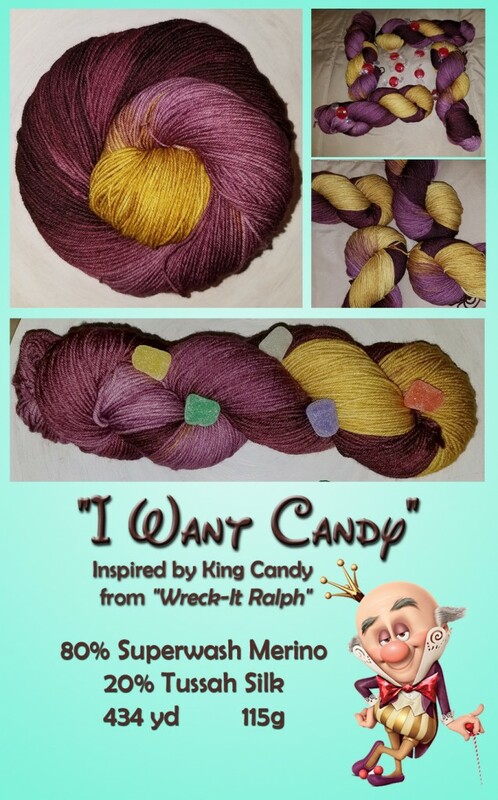 And that’s why Dizzy Blonde Studios, the home of the Mean Girls’ Yarn Club, has looked to King Candy for inspiration for the secondary Knit Dizzney 2018 exclusive colorway! “I Want Candy” will be available for purchase or pre-order as soon as I finish this post! It’s 115 grams, 434 yards of luxurious Silk Merino sock, in shades of lavish gold, sumptuous plum and glorious maroon. All this luxury for only $28. “I Want Candy” will be dyed on an “as ordered” basis, so please allow 2-3 weeks for delivery. It is available to everyone, but for a limited time only. If you’re unable to attend Knit Dizzney, and want to purchase the yarn only, you will be able to do so here, starting August 7th until September 30th, 2018. Otherwise, you should pre-order all of your desired Knit Dizzney 2018 goodies by using the form in tomorrow’s post to take advantage of the bundle discount. Tune in tomorrow when pre-orders open! I will be sending out invoices tomorrow.